UPDATED: Wed., July 25, 2018, 10:42 p.m.
HOLLYWOOD, Calif. – It was a safe bet that the subject of sports gambling, and how it might bleed into college athletics in the near future, would be a popular talking point Wednesday at Pac-12 Football Media Day. Sports betting has become a pervasive topic since the Supreme Court ruled in May that individual states have the freedom to regulate gambling. Legalize it or don’t legalize it – that decision is in the states’ hands, and three have already chosen to do the former: Delaware, New Jersey and Nevada. So what’s the direct impact on college football and the Pac-12? With the legalization of sports gambling, college coaches could be encouraged – or even required – to provide weekly player availability reports, or in more simpler terms, injury reports. That could make things fuzzy in an era in which many coaches prefer to keep such intel concealed – for the protection of their players and to ensure no advantage is given away during planning or preparation. 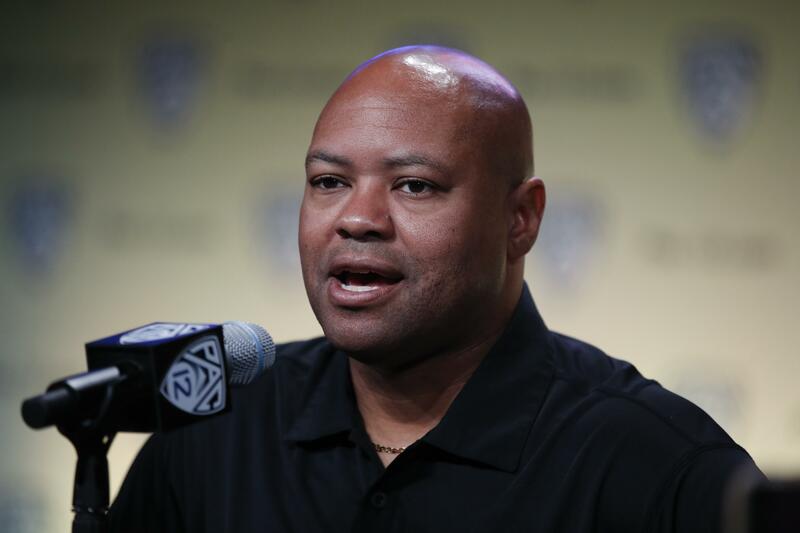 Stanford coach David Shaw, who spent nine years as a position coach in the NFL, held steadfast to his belief that injury reports don’t belong in the college game, insisting medical information of young adults shouldn’t be made available to the public. “I would not be comfortable with that,” Shaw said. “… There is a stark difference between working with professionals and working with college kids. I do not feel right giving out medical information of a 19-year-old. I think it’s wrong in any way, shape or form. Kick returns and redshirts: NCAA rule changes involving both topics were discussed at length during the proceedings. Beginning in 2018, players are allowed to “fair catch” kick returns inside the 25-yard line and the ball will be moved up to the 25-yard line, like it would be for a touchback received in the end zone. The NCAA also passed legislation this offseason that allows redshirting players to appear in up to four games without forfeiting their eligibility. Pac-12 coaches like the modification. Five conference schools introduced new head coaches this season. Excluding Chip Kelly, an old pro at the annual gathering, all made their debuts. Kelly, the former Oregon maestro, is taking over for Jim Mora at UCLA. Ex-Texas A&M coach Kevin Sumlin replaces Rich Rodriguez at Arizona. Jonathan Smith, most recently the offensive coordinator at Washington, enters year No. 1 at Oregon State. Mario Cristobal was elevated at Oregon, replacing Willie Taggart, and Herm Edwards left his NFL analyst booth to takes the reins at Arizona State. An injured knee will preclude talented Washington tight end Hunter Bryant from opening the season and it’s unclear if, and when, the Huskies will get their Freshman All-American back. “He’s not going to be ready at the start of the season,” Petersen said. “May end up being his redshirt year, especially with the four games that we can play. Bryant was the Huskies’ third-leading receiver last fall, with 22 catches for 331 yards and one touchdown. Published: July 25, 2018, 5:09 p.m. Updated: July 25, 2018, 10:42 p.m.